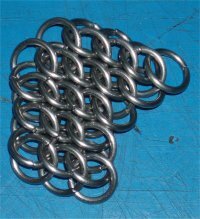 Use rings with an AR of 5 or a bit higher, as lower ARs will result in a weave too tight to be woven at all. Only very narrow strips consisting basically of weave border rings only (like 'standard' GSG) work at ARs down to around 4.6 (FYI: these numbers are real, measured ones, NOT mandrel diameter based). 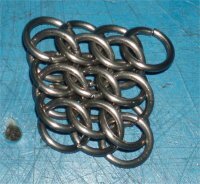 As I experienced the 'GSG-style' (=sideways) weaving direction the most versatile and well behaving one, I will show the making of ONE biased example here; others can be made in similar ways. 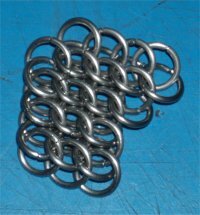 Start working in GSG direction - oraat style, half-row for half-row - NO speed weaving. Use that technique to make a 3-column wide GSG. A tutorial for creating three-column GSG is in the weave articles section as well, if the starting seems to become a show stopper for you. 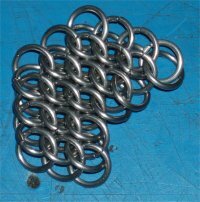 Then widen that GSG to four rows at one side - just add a pair of rings. 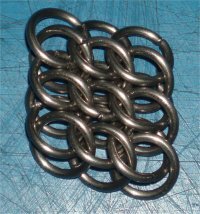 If you have four rows, you already know the technique to widen the pattern sideways and have one side of the pattern. 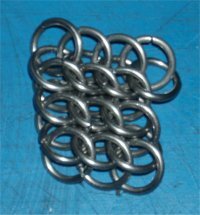 Leaving the number of rings used to widen the one side away at the other strip side is straightforward thinking. 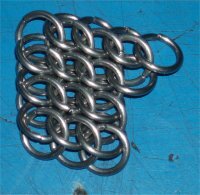 After having reached a sufficient amount of rows the starter piece can be removed, or maybe tapered down to a single clasp attachment ring - finishing the chain by tapering down works similar. 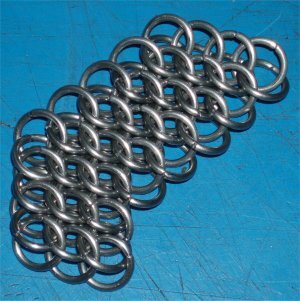 Once you have gained some experience, you may use the very same technique with narrower strips, maybe biasing in the other direction, changing the biasing amount (= changing the number of rows woven straight before one or even more rings are added), and much more. Just go playing at that playground. You won't be disappointed, as nearly all weaving directions result in fine looking weaves, that always hold their shape very well - and yield sometimes astonishing results.